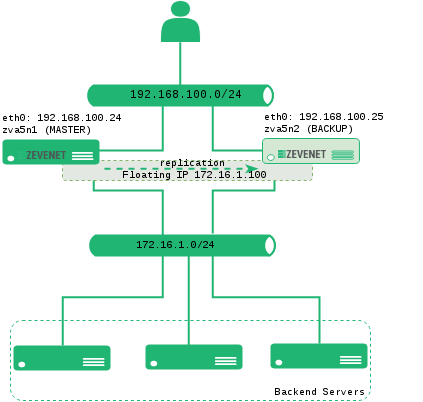 The following article describes the procedure of updating Zevenet 5 Cluster in order to obtain the minimum downtime during the update procedure. According to the services configured, you can experience a minimum of downtime or no downtime at all. If no cluster is configured, the downtime could be incremented for one minute in the worst case. Note that if you are currently running an older Zevenet version than 5 then you should review if your cluster is ready to be migrated according to the article Configure Zevenet 5 Cluster. Download the latest available version of Zevenet 5 EE from Zevenet Central https://central.zevenet.com, menu tab Knowledge > Enterprise Edition > ZVN Enterprise Edition Full Package 5.x.x which includes the requirements and procedure before and during the update per node. 1. Go to the node with BACKUP role (following the current example zva5n2), and apply the update as described in the instructions of the update package. 2. Once the update process concludes verify that it finished without errors. If some error is detected in the installation process please open a support ticket and attach the output of the installation process to it. 3. If there are not errors during the update of the BACKUP node (zva5n2), go to the web GUI in the MASTER node (zva5n1), and go to the menu section System > Cluster, and put the MASTER node in Maintenance mode as it is shown below. 4. As soon as the MASTER node changes to maintenance role then the MASTER role will be moved to the already updated node, zva5n2. At this moment only the memorized persistence session will be regenerated in the new MASTER node, so if users are logged in some application they could experience a re-login. 5. Now update Zevenet 5 in the old MASTER (zva5n1, currently in Maintenance mode) as it is described in the update file instructions. 6. If the update is done without any error then proceed to disable the Maintenance role through the web GUI in the current host (zva5n1). 7. If the fail-back service is enabled then MASTER role will be moved automatically to this node again. If not, the MASTER role will keep in the second node (zva5n2). 8. In order to force the MASTER role to node zva5n1 then you only have to enable the maintenance mode in node zva5n2, and the MASTER role will be taken by node zva5n1 automatically as just to before the update. As soon as the MASTER role has been moved to node zva5n1, please disable Maintenance mode from node zva5n2 again and the service will be in the same status than just before to start (MASTER zva5n1 and BACKUP zva5n2). Enjoy your just updated Zevenet 5 without downtime!